An award to celebrate musicians who perform new music at the highest standard. This could be the best one-off performance or a number of performances that adds to a portfolio of work across 2016. Red Note Ensemble is Scotland’s contemporary music ensemble. We develop, perform, present and find new audiences for new music within Scotland, the UK and internationally. 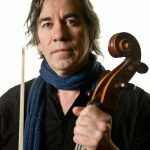 The ensemble was founded in 2008 by Scottish cellist Robert Irvine, and is directed by John Harris (Chief Executive and Artistic Co-Director) and Robert Irvine (Artistic Co-Director). The Ensemble performs the established classics of contemporary music, commissions new music, develops the work of new and emerging composers from around the world, and finds new spaces and new ways of performing and presenting contemporary music to attract new audiences both within Scotland and elsewhere. Red Note’s performing ensemble is drawn from the deep talent pool of Scottish new music expertise, and counts amongst its players some of the very finest performers working in the UK today. Red Note’s busy schedule comprises tours, site-specific work and cross-artform collaborations on large and small scales, locally and internationally, and a highly-developed access, engagement and participation programme. Red Note is Associate Contemporary Ensemble at the Royal Conservatoire of Scotland in Glasgow, an Associate Company of the Traverse Theatre Edinburgh, and Associate Ensemble of the sound Festival Aberdeen. Robert Irvine was born in Glasgow, and at the age of 16 was awarded a scholarship to the Royal College of Music where he studied with Christopher Bunting and Amaryllis Fleming. On leaving the Royal College, he went on to further studies with William Pleeth and Pierre Fournier before joining the Philharmonia as sub principal cello. He also worked extensively at Aldeburgh, forming the Brindisi String Quartet and working closely with Sir Peter Pears as continuo cellist and as principal cellist of the Britten Pears Orchestra. At this time he toured much of Europe with the Brindisi Quartet, making numerous festival appearances, broadcasts and recordings. He left the Philharmonia in 1988 to take up the position of principal cello with the Academy of St Martin-in-the-Fields. In 1990, he returned to Scotland to take up the post of principal cellist with Scottish Opera, and with Sally Beamish and James MacMillan founded the Chamber Group of Scotland, performing and broadcasting a wide range of music both chamber and solo. He has recorded several CDs including the complete cello works of Sally Beamish for the Swedish label BIS, which received high critical acclaim, including CD of the month in the Gramophone magazine in December 2001. 2008 saw the release of two new CDs for Delphian Records,the complete cello works of Giles Swayne with Fali Pavri on piano and sonatas by Rachmaninov and Shostakovich with Graeme McNaught. He is a senior tutor of Cello and Chamber Music at the Royal Conservatoire of Scotland and Artistic Director of Red Note Ensemble. Robert plays on a very fine cello by Melvin Goldsmith in 2014, and a fine bow by Howard Green, made in 2011. 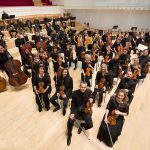 The BBC Scottish Symphony Orchestra is Scotland’s national broadcasting orchestra and maintains a busy schedule of broadcasts for BBC Radio 3, BBC Radio Scotland, BBC Television and Online. It has been at the heart of the nation’s cultural life for many years and has a well-earned reputation for its creative ambition, its pioneering spirit and wide range of repertoire. Based at City Halls in Glasgow, the BBC SSO is Scotland’s leading champion of new music, and has strong links with local communities through its thriving outreach programme. 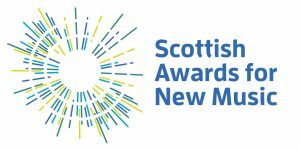 It is a major partner in Big Noise, Scotland’s innovative project for social change through music, plays a major role in the BBC’s Ten Pieces initiative, and has a close association with the Royal Conservatoire of Scotland. As well as taking live music to venues across Scotland, it appears regularly at the BBC Proms and Edinburgh International Festival. In recent years the orchestra has toured to India, South America and China. Thomas Dausgaard became Chief Conductor in September 2016 taking over from Donald Runnicles who held the post since 2009. A past recipient of the Royal Philharmonic Society Award for Best Orchestra, the BBC SSO’s commercial recordings have received a number of prizes, including four Gramophone Awards. MacGillivray is the Highland name of Scottish writer, performance artist and musician Kirsten Norrie. MacGillivray plays electric autoharp, de-railed lapsteel, grand and toy piano, harmonium, dulcitone. 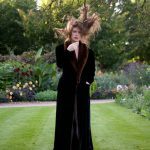 As a musician she has made six records, releasing her fifth album 'Once Upon A Dirty Ear' on Hundred Acre Recordings in July 2015 following a strong review in the Wire Music Magazine of her previous album 'Horse Sweat Chandelier' in 2014. 'Watermarked in Flame', a live album, will be released in 2017 by Antigen Records. A long time collaborator with James Young who performed extensively with Nico, co-wrote with John Cale and wrote music cult classic 'Songs They Never Play On the Radio' (Bloomsbury), MacGillivray has performed internationally, been aired on BBC Radio 3 Late Junction and The Verb and Radio Wales and provided soundtracks for British film 'Swandown' (Channel 4/Britdoc) and appeared in 'By Our Selves' (2015) in a cameo alongside graphic novelist Alan Moore and Toby Jones whilst also contributing to the soundtrack. In 2014 MacGillivray received funding from the Gaelic College Sabhal Mor Ostaig, Isle of Skye and Creative Scotland to make a Gaelic short film "Aisling Sheòrais MhicDhòmhnaill: George MacDonald's Dream".